With the Kama Sutra Massage Oil Tranquility Kit 5 Pack you can take the romance with you. Try all of five blends of Kama Sutra Aromatics Massage Oil with this travel kit. 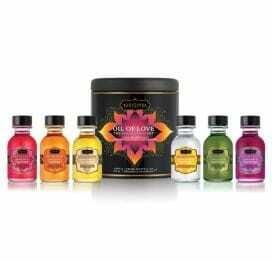 Includes five petite massage oils in a zippered travel case. The TSA approved sizes are perfect for travel. Made with essential oils, these rich, emollient formulas makes it a pleasure to give or receive a romantic, full-body massage, wherever you go. Kama Sutra Massage Oil Features: Made with essential oils and skin nourishing Vitamin E. Ultra moisturizing and silky smooth for the perfect full body massage. Travel sized and TSA approved. 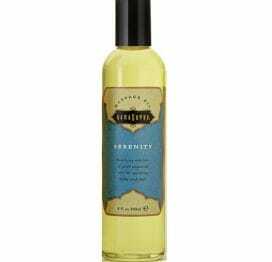 Kama Sutra Massage Oil Scents: Serenity essences of marjoram, geranium and lavender a calming blend created to ease stress and release tension. Pleasure Garden combines rose, jasmine and sandalwood a euphoric floral blend designed to promote feelings joy and release inhibitions. Sweet Almond a classic blend of sumptuous sweet, almond oil. Harmony Blend essences of juniper, pine, lavender and rosemary a soothing, rejuvenating remedy for the mind and body. Soaring Spirit sensual blend of essential oils of orange, lemon, mint, geranium, ginger, fennel and rose. Made with essential oils and skin nourishing Vitamin E. Ultra moisturizing and silky-smooth for the perfect full body massage. How to use: For sensual massage pour Kama Sutra Massage Oil into your hands or directly onto your partners body and massage the oil into their skin with slow, even strokes. As a daily moisturizer massage oil into your own skin after a bath or shower for smooth, hydrated skin all day long. For the bath pour into running bath water. Let the essential oils guide you to a state of deep relaxation as you soak. Emerge with smooth, silky skin. Made in the USA.